But last night I decided to use some of my Young Living essential oils. I have lots of herb oils to choose from including oregano, marjoram, and basil to name a few. For this recipe I chose thyme and rosemary. The original recipe calls for dried thyme and that’s always worked fine for flavor, but my guess is there’s not too much nutritional value left in that half teaspoon of dried herb. Perhaps some, but I’m fairly certain that a few drops of essential oils are packing a huge health punch in comparison. I made sure to stir in the essential oils right at the end, so as not to overheat the essential oils and diminish the benefits. Most often I’m using these oils for immunity building, easing tired muscles, or diffusing (love Rosemary with orange or lemon!) so this was fun to try them in a dinner recipe. Clearly I’m not a health freak, otherwise I wouldn’t have cream of chicken soup in my pantry but I openly admit we would not eat most nights if I didn’t have a collection of quick tried-and-true weeknight recipes that don’t require lots of pre-planning. 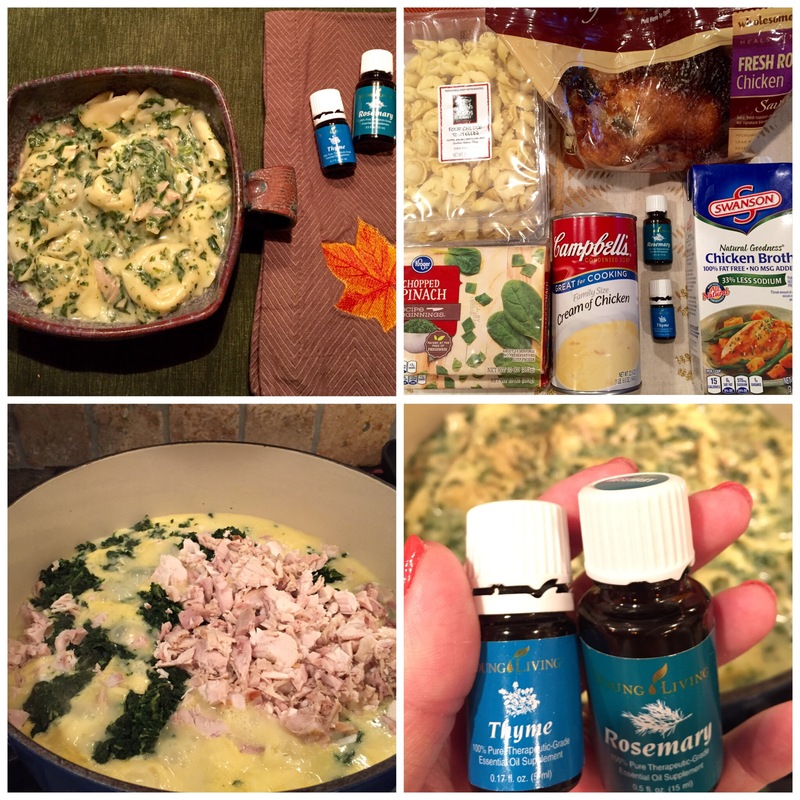 This is for sure one of those recipes and using the essential oils tasted just as great as the original recipe, maybe better! 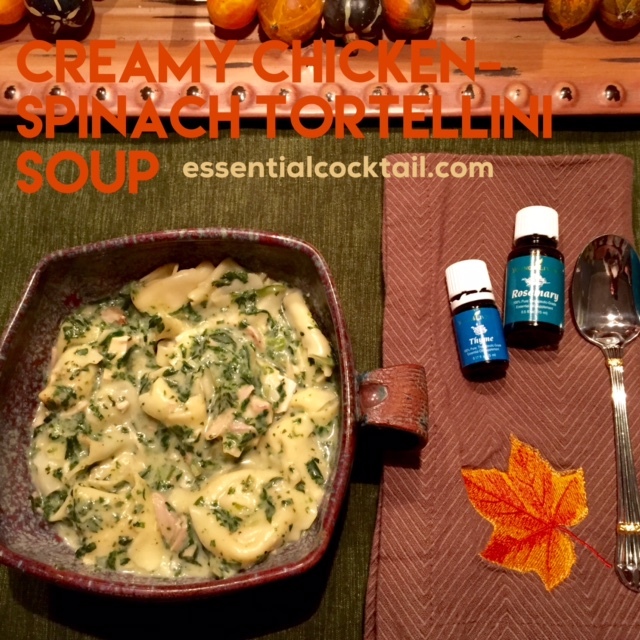 Cook tortellini in a Dutch oven according to package directions except use 2 cups chicken broth instead of water. Add rest of chicken broth, cream soup, and milk, then gently stir in the thawed & drained spinach, and cooked chicken. Bring to a boil, cover, and then reduce heat to medium. Cook until thoroughly heated. Turn off heat then stir in just two drops each Thyme and Rosemary essential oils (try for one drop and you’ll probably get two!) Add ground pepper to taste & stir to incorporate. Serve with a side salad if you’re an over-achiever.